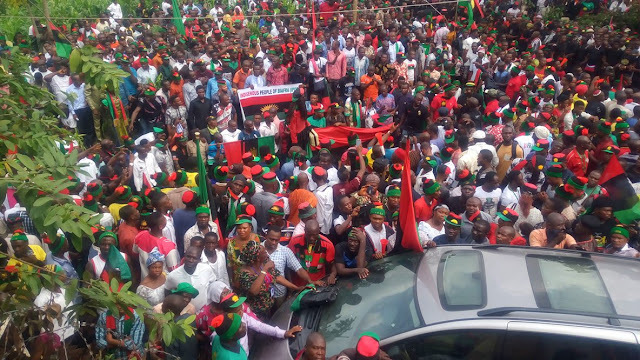 IPOB CANNOT ABANDON BIAFRA RESTORATION FOR NIGERIA RESTRUCTURING The attention of the Indigenous People of Biafra (IPOB) has been drawn to an online publication to the effect that Mazi Nnamdi Kanu the Leader of the Indigenous People of Biafra mandated the revered and highly respected Elder Statesman Professor Ben Nwabueze to declare to Nigeria that he is ready to call off the Biafra struggle if there is progress in restructuring Nigeria. IPOB hereby wish to put the record straight as such claims if not properly understood may convey the erroneous impression that we are prepared to trade our noble quest for the restoration of Biafra for restructuring. We are making it very clear that Mazi Nnamdi Kanu and IPOB have no regard for the concept of restructuring Nigeria in our pursuit of self-determination because the main advocates of restructuring are yet to agree a common position as to what restructuring is all about. Restructuring is the corporate management term for the act of reorganizing the legal, ownership, operational, or other structures of a company of which Nigeria formerly known as Royal Niger Company can sort that out with their slave master Britain. Nigeria restructuring can never be an answer to the injustice, marginalization, killings, exploitation and economic blockage meted out to the entire people of the south east region. Biafrans have been denied all basic amenities needed to live as human beings and no amount of restructuring can solve that problem apart from the total restoration of an independent state of Biafra. Restructuring in Nigeria is interpreted in many ways and cannot be accepted by IPOB leadership because to some it means devolution of power, to others, it is a return to true federalism. In as much as the Hausa Fulani hold tenaciously to the claim that Nigeria is their grandfather's estate, there is no way they would sincerely and wholeheartedly accept to restructure because 47 years after the civil war, rehabilitation, reconciliation, and reintegration were promised to the South East and South South regions but till date no single federal government project has been carried out in the South East to give us a sense of belonging in the Nigerian project. We must recall that some weeks back, the issue of restructuring as well as the establishment of South East Development Commission were brought to the floor of the Nigeria Senate and the House of Representatives respectively and we all know what became of both initiatives. They were simply thrown into the waste bin. It is important to point out that Aburi Accord was also about restructuring which Gowon rejected, the result of which is the declaration of war against Biafrans that resulted in the worst atrocities committed and still being committed against our people. It is therefore needless and irresponsible to follow the same path that have brought death, misery, and hardship to Biafran people. It is better to die once fighting for our freedom than to die many times participating in Nigerian politics. The Indigenous People of Biafra has wasted enough of their inherent talents and creativity in this hell hole contraption called Nigeria where truth have become anathema while lies are celebrated. Nigeria is simply a grave yard for creativity and invention. It is foolhardy to expect anything different from a system where the pillar of its existence revolves around shearing of revenue at the end of each month. Other ethnic nationalities that make up the Nigeria geographical space may prefer to continue in their subservient position vis- a vis the Hausa Fulani oligarchy, they are probably happy to accept their slavish status but we the Indigenous People of Biafra state unequivocally that it is time to go our separate ways so that each component Nation can lead their lives in accordance with their cultures and values. The Indigenous People of Biafra (IPOB) under the leadership of Onyendu Mazi Nnamdi Kanu are not against anybody or group of persons, we are an unarmed, nonviolent, indigenous people exercising our inalienable right to Self Determination. IPOB is a principled and ideologically based movement in pursuit of our self-determination right. We are neither into Nigeria politics nor party politics for that matter, Mazi Nnamdi Kanu is never a candidate for Nigeria politics and will never be one. His heaven ordained mandate is to restore the Sovereign and independent Nation of Biafra and this we are confident he will accomplish because he has the confidence and trust of the Biafran people but above all, he has the backing of heaven and the grace of our creator CHUKWUOKIKEABIAMA. Those talking about restructuring are free to do so because it is assumed that we are in a democratic dispensation, people are entitled to their views and have the freedom to express them. The position and views of the leader of the Indigenous People of Biafra (IPOB) Mazi Nnamdi Kanu as it concerns Biafra restoration project is in the public domain, it is, therefore, unconscionable and unethical for the Nigerian media or anyone for that matter to attempt to misrepresent or distort his views in public for reasons best known to them. The Indigenous People of Biafra (IPOB) under the leadership of Onyendu Mazi Nnamdi Kanu have not come to restructure Nigeria or any defaulted company, we are not asking for creation of states and local government, neither are we fighting for any political position in Nigeria; our objective is simple and straight forward; which is the restoration of the Sovereign and Independent Biafran Nation and this we are pursuing through universally recognized, accepted and guaranteed methodology. In this regard, the demand by the Indigenous People of Biafra for a referendum to determine our collective social, economic and political systems is a legitimate demand. Sovereign power resides with and belongs to the people, it is, therefore, our right as indigenous people to freely determine where we would like to belong. The restoration of Biafra is not negotiable it cannot be substituted with or for any restructuring of Nigeria because we are fighting for our freedom with our blood and millions of Biafrans have lost their lives and many are still in prison till date. IPOB is not in a game of popularity contest or a high school debate nor bothered about who clinches the first prize. Mazi Nnamdi Kanu our leader is not a Nigerian politician; the restoration of Biafra is why Nnamdi Kanu and IPOB came into existence and for that objective, we have sworn an oath to accomplish our mission.